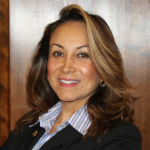 Jeannette Aparicio has been with the City of Plainfield for more than 23 years. During her tenure she has been a member of multiple departments and divisions, and currently serves as the economic development representative in the Economic Development Department. Her responsibilities include interaction, education and guidance between existing and new entrepreneurs and the city. She is responsible for managing the Urban Enterprise Zones programs, seminars and networking, and new initiatives that support the city’s economic development team. She is originally from Colombia, and came to the United States in 1982.